There's a tradition in Star Trek that it takes three seasons for each series to really find its feet. Whilst Deep Space Nine's first two seasons had been entertaining, it still lacked a really notable sparkle to set it apart from both TNG and other SF series that were starting to appear at the same time, most notably Babylon 5. At the end of Season 2 DS9 was finally given the kick up the backside to really push it to become something more than the sum of its parts. There's a dangerous new force in the Galaxy: the Dominion, an alliance of alien races unified under the rule of the Founders, shapeshifters who hold all other 'solid' races in mistrust after millennia of persecution by them. The wormhole in the Bajoran system directly links the Federation and the Dominion territories together, and Season 3 opens with a cold war between the two getting underway. 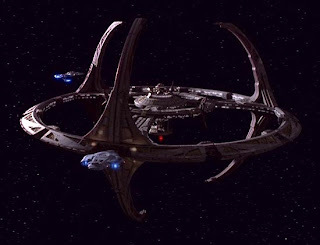 A Federation attempt at peaceful negotiation is rebuffed, and Deep Space Nine is soon being reinforced with new weapons and a new defender in the shape of the first-ever Federation warship, the USS Defiant. However, whilst the threat is lurking in the background there is curiously little activity between the two sides, and after a while the series falls back into its traditional episodic structure. Luckily, the show delivers a series of solid stand-alone episodes here, ranging from the comedic to the dramatic. There's also the first appearance by Robert O'Reilly in DS9 as Klingon Chancellor Gowron, prefiguring his later, more prominent role in the series. Whilst there's little action in the early season on the arc front, there's lots of background detail which comes together nicely later on, such as the growing momentum behind the Cardassian dissident movement and Garak's continuing yearning to go home to his people, whilst vague rumours of a Cardassian military build-up that even Dukat has no knowledge of hints of something cataclysmic to come. We finally get to that point in the epic Improbable Cause/The Die is Cast two-parter, which ends in the biggest space battle in Star Trek history to that point and the chilling line, "The only threats to us in the Alpha Quadrant now are the Federation and the Klingons, and neither are going to be a problem for much longer." That line leads us into the magnificent Season 4. With the destruction of the Cardassian Obsidian Order, a full-scale revolution gets underway on the planet, triggering Klingon fears that the Dominion are masterminding events as a prelude to invasion. On that flimsy pretext, the Klingons invade Cardassian space, sparking a period of renewed tension with the Federation and even an abortive attack on Deep Space Nine itself. To deal with the Federation's belligerent former allies, Sisko recruits Lt. Commander Worf to join the station command crew. This shakes things up nicely, as Worf fits much better into the darker and more conflict-driven DS9 universe than he ever did on TNG. With the Federation and the Klingons at each other's throats, the Dominion has a free hand to get up to what they want to in the background and several key episodes address this. Season 4 is also the point that recurring actor Jeffrey Coombs hits his stride with the introduction of his two best characters, the Ferengi liquidator, "Brunt, FCA" and the Vorta Weyoun. Season 4 is DS9 firing on all cylinders, delivering brilliant moments of drama, action and even comedy, something Trek has a mixed record on. Possibly the show's creative high point, although there is a the feeling that the introduction of the Klingon threat has taken the show away from where it was supposed to be heading. That point is addressed at the start of Season 5 with the discovery that the Dominion have infiltrated the highest echelons of the Klingon Empire and masterminded the conflict with the Cardassians and the Federation for their own purposes. Having weakened the Alpha Quadrant sufficiently, the Dominion form an alliance with the Cardassians and start flooding Cardassian space with their warships. The parallel to pre-WWII Europe works extremely well. Whilst the episodes dealing with the main arc (most notably the In Purgatory's Shadow/By Inferno's Light two-parter) are magnificent, there are still many brilliant individual episodes here, such as the hilariously inventive Trials and Tribbelations and the extremely disturbing The Assignment. There are a couple of creative misfires, such as Odo's temporary transformation into a human that doesn't work quite as well as it should, but overall Season 5 maintains the quality of the season that preceded it. It ends on a high point, with the comical episode In the Cards (featuring some of the biggest laughs in Star Trek's history, such as the inherent ludicrousness of the Federation abandoning money in favour of 'a philosophy of self-enlightenment' and Ronald D. Moore's hilarious pisstake of technobabble with Dr. Giger's immortality device) preceding the monumental cliffhanger of Call to Arms, where the Federation and the Klingons feel compelled to launch a pre-emptive assault against the Dominion, with some jaw-dropping final moments as the Dominion capture DS9 and the Federation is forced to retreat. Deep Space Nine Season 3 (****) is where the show finds its feet. It is available on DVD in the UK and USA. Deep Space Nine Season 4 (*****) is where the show hits its creative highpoint, and is likewise available in the UK and USA. Deep Space Nine Season 5 (*****) maintains the high quality of the fourth season and pushes the story arc forward and sets things up for an apocalyptic final two seasons, and is also available in the UK and USA.